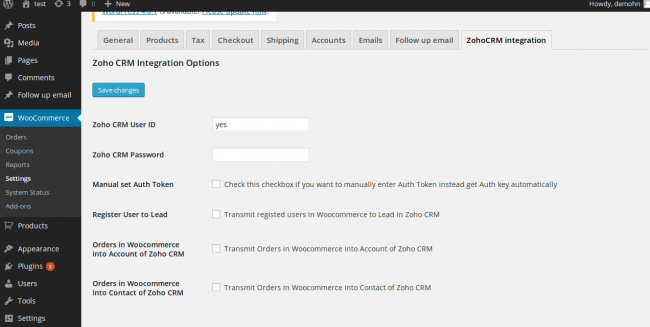 Brings for you a perfect solution for synchronize from Woocommerce site to Zoho CRM. Stop using worksheet programs to transfer data from Woocommerce to CRM. Woocommerce Zoho Integration will take on all of the heavy lifting for you. Using an CRM program is difficult enough. We understand not everybody loves to code, and complicated settings can turn off company managerseasily. Magenest Zoho Connector for Woocommerce transform the labor-intensive data transferring process into a much easier task. You simply need to look for the credentials for the Zoho app in your account setting, choose a way of syncing, map data fields from Woocommerce to Zoho. Merchants come from different business industries, with diverse working processes and requires different data to be synced from Woocommerce to Zoho CRM, Magenest Zoho connector comes packed with a range of data fields for you to synchronize from to Zoho. There is an unlimited number of ways to sync. The sky is the limit. When client creates a new account in Woocommerce, client profile will be synced to Zoho.